The Class of 2018 was the first cohort at the University of New Mexico to participate in ExceedU, a new program designed for incoming freshmen. Drawing from the results of the Foundations of Excellence (FOE) project, Dean of Students, Enrollment Management and University College’s Academic Communities Program, a more effective 'rite of passage' was developed for freshmen, where they are not only welcomed to the UNM community, but celebrated and supported. The academic expectations can be overwhelming to a freshman. Compared to high school, college courses tend to shift away from memorization and rote learning, toward research, analysis and objective evaluation. Freshmen also face new social and emotional experiences and responsibilities. They worry about being smart enough, making friends, roommates, staying safe and financial concerns. But mostly they worry about being alone and unsupported. For this reason a large percentage of freshmen do not make it to sophomore year. FOE created the ongoing task force, First Year Steering Committee (FYSC), which has been studying ways to reach first year students. One of those efforts studied best practices at other universities across the country and found, among other things, that maintaining dialogue with freshmen throughout the first year is key. “We forget that most freshmen come to Student Orientation, leave after the session, and then start school with no real time to familiarize themselves with campus and college culture,” said Sonia Rankin, associate dean of University College. To help address this concern, ExceedU was created. 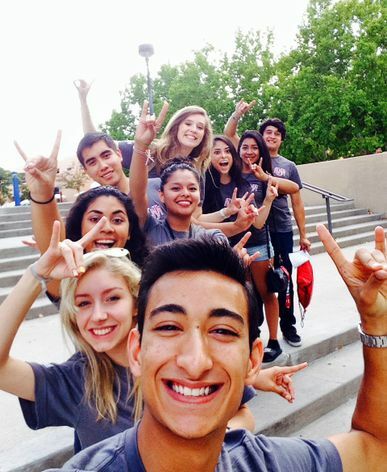 Freshman students participating in ExceedU, a new program designed for incoming freshmen, are not only welcomed to the UNM community, but celebrated and supported. ExceedU is a two-day academic preparedness set of workshops on everything from how to handle finances and staying healthy to college level writing and research tips. The committee noted that many universities also require freshman to take courses that offer sound ways to make the transition to college life easier. UNM offers three credit academically centered courses designed to help students transition into life and learning at UNM through the Transition Communities Program. “ExceedU is free and aimed at preparing students for success,” Haquani said. “By the end of the two-day program, I realized the underlying message, "Commit to the college experience, and you'll meet with success!"